Kathleen Kennedy is one of two 2009 winners of the EcoDaredevil award, which honors those who are taking risks to promote conservation and environmental sustainability. Kathleen, a Missoula high school biology teacher, was admonished by her own school board for showing "The Story of Stuff," a popular film about the environmental costs of rampant consumerism, but Kathleen persisted. Kathleen took time away from her busy teaching schedule to provide the following update on life since receiving the EcoDaredevil award in September. Photo above: Kathleen's EcoDaredevil award helmet, complete with a signature from singer Eddie Vedder. Receiving an EcoDaredevil award has been a really fun and inspiring experience. Thinking about Evel Knievel trying stunts and then dusting himself off and trying again when things didn’t go as planned reminds me of the resilience that I have had to bring forth since my ordeal began. Comparing myself to Evel of course also makes me laugh—something I didn’t do much last year! The award has given me a light-hearted way to discuss controversy and polarization with my students. Ironically, the controversy about the Story of Stuff as an educational video reached a new level just shortly after the EcoDaredevil awards ceremony. After being informed by one of his “watchdogs”, Glenn Beck of Fox News discussed the film and its use in classrooms on his program and incited his viewers to complain to their school boards. The Story of Stuff blog was filled with outrageous reactions. Having Glenn Beck challenge the Story of Stuff is yet another validation of the film’s important message and renews my resolve to ensure that students are given opportunities for critical thinking in my classroom. On a funny note, I brought my EcoDaredevil helmet with me to Pearl Jam’s concert near Portland, OR in September with the plan to have the band’s bassist, Montana native Jeff Ament, with whom I had shared my story, sign it. To my surprise the entire band signed the helmet. I got to have a nice chat with Jeff before the show that included me giving him his own EcoDaredevil sticker! 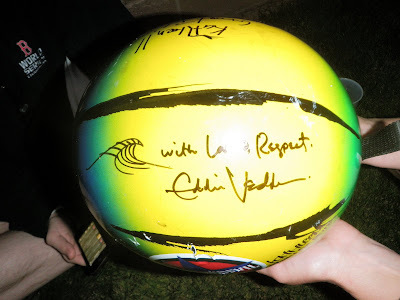 Interestingly, Eddie Vedder signed “with Love & Respect” and drew a picture of a wave, which makes me wonder if he is aware of the Great Turning (visit http://www.thegreatturning.net/ for more info). 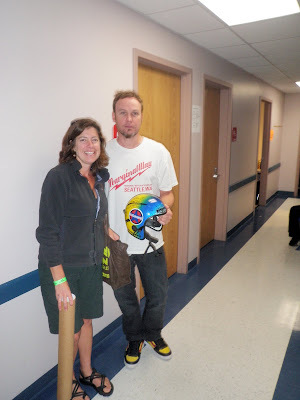 Photo above: Kathleen with Pearl Jam bassist and Montana native Jeff Ament, an EcoDaredevil supporter. My school year is going really well so far and I think this award allowed me to put things in perspective and go forth! Thanks for recognizing the role that educators have in helping us jump the chasm to sustainability. For more information on the EcoDaredevil award, visit ecodaredevil.blogspot.com. For more on the Story of Stuff, visit http://www.storyofstuff.com/.